On December 9, 2004, Junior High School 117 on East 109th Street in New York City was renamed The Tito Puente Education Complex. My sister, Judy Cohen, who has taught there for some years, told me what an extraordinary a school it is and how fitting that they chose to name it after The King, Tito Puente. Tito was born just a block away on 110th Street and, wherever he traveled, he was always proud to say he came from El Barrio. 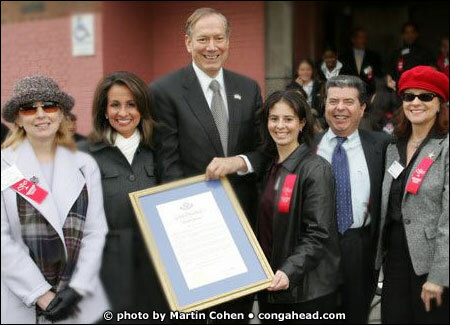 Governor George E. Pataki, Congressman Charles Rangel, School Chancellor Joel I. Klein, Manhattan Borough President C. Virginia Fields, and Robert Sancho joined the Puente family for this wonderful occasion to honor the most significant name ever in Latin music. Also present were Dave Valentin, Jimmy Owens, and Joe Conzo, who joined Joyce L. Duncan, principal of the school, in celebrating this event. Before closing the outdoor ceremony Sharon Heller conducted the student choir in the song she wrote, "Beat of the Drum." After the outdoor ceremony, percussion and dance workshops were provided in classrooms by Eddie Torres and his wife Maria, and Bobby Sanabria, accompanied by Ron Puente. During the Sanabria clinic, my wife Vivianne was invited to join the dance portion of the workshop, which she did with grace. Vivianne and I were greatly honored to join the Puente family for a special luncheon with some students in the school library.